The state machine component adds a Sumerian state machine to the entity. 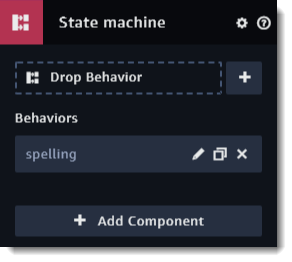 You can use state machines to create dynamic and interactive scenes that feature animation, physics, special effects. State machines are specific to an entity, so you can have multiple state machines in your scene that trigger on different events. A state machine has one or more behaviors that organize scene logic into states, actions, and transitions. See Amazon Sumerian State Machines for more information.